Ms B Hay, a representative of Polyfest (the festival), provided some background to the festival. She said it had begun in 2012 with 750 participants and had continued to grow every year. She noted the festival was already fully subscribed for July 2019. She considered the festival’s popularity was because it acknowledged and celebrated students’ cultures. 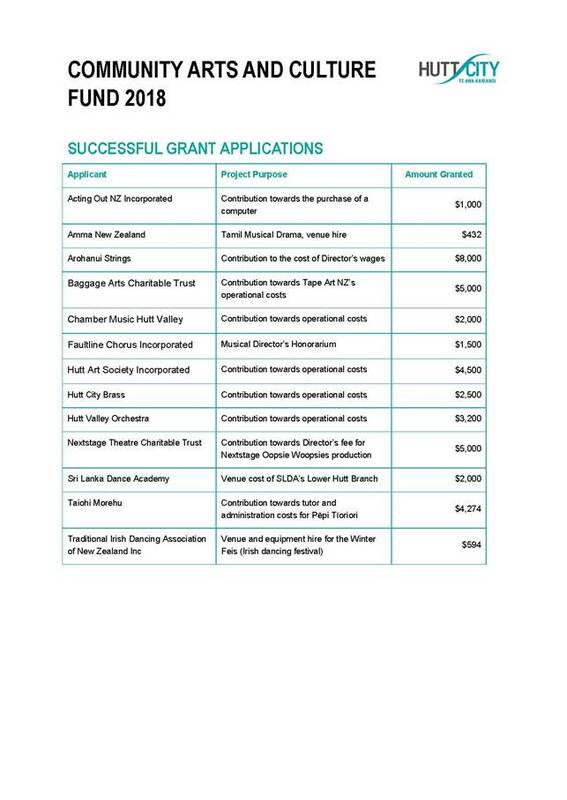 Ms Hay advised that Koraunui School had underwritten the working fund for the festival each year but she recognised this was not a sustainable arrangement. She said the festival was not core school business and was a strain on school resources. Ms Hay had consequently set up the HuttFest Trust (the Trust) to manage the festival and attract more sustainable funding. She said the Trust would continue to focus strongly on Māori and Pacifica but would also include other cultures. She believed a working fund would provide stability for the festival and she indicated the Trust would welcome Council support in this regard. Ms Hay commended Koraunui School who supplied a number of volunteers for the event each year. She acknowledged Te Awakairangi Health Network who had partnered with festival organisers to run the event. In response to questions from members, Ms Hay advised that Council had been supporting the festival event but she had not been successful in applying for working funds. She added low decile schools would struggle to provide financial assistance to the event. The Chair thanked Ms Hay for her work with the multicultural community. Ms So’otaga said Poly Odyssey 2018 (the event) worked in partnership with Polyfest and would continue as a sister programme to Polyfest. She advised the event was the first of its kind in Lower Hutt. She said it was a day where both young and older students could build on knowledge of their culture and be immersed in the Pacifica experience. She added it was not easy for schools to give children the opportunity to connect to their Pacifica roots. In response to a question from a member, Ms Webster said schools had asked for Poly Odyssey to be an all-day event and open to all students, not just Pacifica. In response to a question from a member, Ms So’otaga agreed she would welcome a stronger partnership with Council to enable the event to connect to a wider audience. She noted that Polyfest had been a highlight in Council’s Annual Plan under ‘strong and inclusive communities.’ She added the event would like to extend its programme to demonstrate how indigenous traditions link into STEMM subjects. Members congratulated Ms A So’otaga and Ms J Webster on their work with Pacifica students. Mr N Beynon, archaeologist, provided a verbal update. His presentation revealed many recorded archaeological sites in Lower Hutt, including pre-European sites. He explained that many archaeological sites were under old buildings and contractors were obliged to stop work if evidence of heritage material was found. He added most archaeological material was found in the first metre of ground. Mr Beynon noted Council’s Resource Consent process contained only a small amount of information on procedures for when archaeological material was found. He further noted Lower Hutt’s District Plan was responsible under the Resource Management Act and under the Heritage New Zealand (NZ) Act for archaeological sites. He asked that Lower Hutt’s District Plan be updated with key archaeological sites in Lower Hutt. He believed the Lower Hutt District Plan needed to be more specific about obligations under the Heritage NZ Act and that Council needed to improve communication with Heritage NZ. Mr Beynon recommended pre-1900 buildings be identified using a GIS layer so that they could be distinguished before being demolished. He suggested that Council educated developers and contractors so they knew what to look for when they were building and demolishing. He suggested a brochure could be helpful in that regard. He emphasised the importance of communication with local iwi when sites were undergoing excavation. 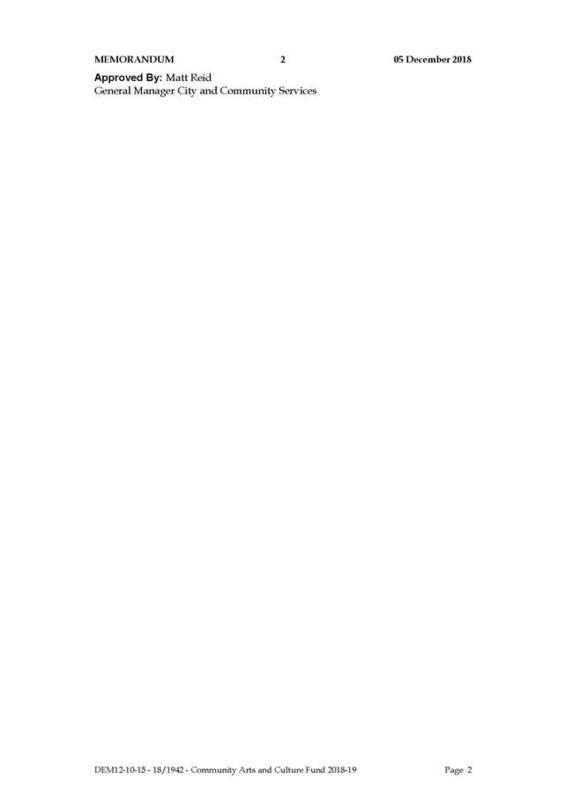 · Educate developers and contractors. The Chair thanked Mr Beynon for his presentation. Ms M Gardner, Graffiti and Asset Advisor, provided a verbal update. She advised she managed the Council graffiti removal and prevention programme which included mural projects. She outlined a number of recently completed mural projects around the Hutt Valley. Ms Gardner advised overseas research on graffiti prevention had inspired her to pilot a graffiti prevention programme (the programme) in Stokes Valley. The research had revealed that youth involvement in the design of spaces reduced vandalism. Ms Gardner said the Stokes Valley programme involved identifying local youth who might benefit from involvement. Ms Gardner said five young people took part in removing graffiti and rubbish, then working with a professional to design and paint murals. She advised there was an 80% reduction in graffiti over the time the programme was running. She said the young people had contributed positively by providing art work for their community. She noted similar positive results had been achieved by using youth and community consultation for other mural painting around the city. She considered the programme needed to be ongoing to have a sustained positive impact. Ms Gardner advised there were several more graffiti prevention projects planned, including new decals for bus shelters, a mural project with Hutt Intermediate School, and small murals across the city. In response to a question from a member, Ms Gardner agreed educating young people was important. Ms Laban advised Council’s Community Projects and Relationships division kept in touch with the families of youth who had been involved in graffiti prevention programmes. She noted many had continued to do positive work in the community. The Chair expressed appreciation for Ms Gardner’s work. He said it was heartening to see that young people were proud to be involved in their communities. Ms Mulligan questioned the Creative Communities Scheme funding awarded to a religious group. She asked if this was in line with the funding scheme’s criteria. 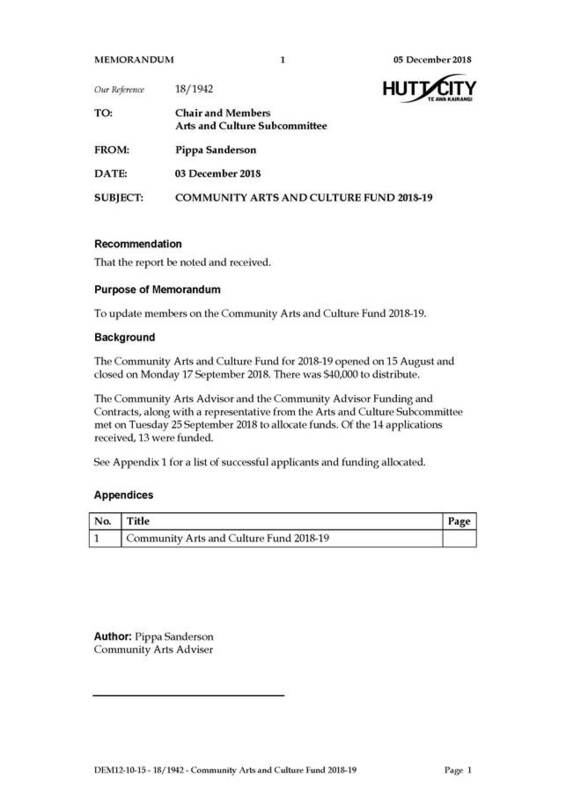 The Committee Advisor agreed to follow this up with the Community Arts and Culture Advisor. The Chair said he had appreciated the input of members of the Subcommittee over the year and had been proud to work with them. There being no further business the Chair declared the meeting closed at 7.36 pm.